East-West, Galactic, Classical, Jazz, Rock styles. Transcendental music, Meditation music, Yoga music, Sacred Geometry art, Mandala art, Visionary art, Meditation videos, Kaleidoscope videos, Fractal videos. Discover what works for you by allowing yourself to enter into higher dimensions by expanding out of the mundane. We are exponentially evolving. Journey into your Cosmic Temple. Follow your bliss. 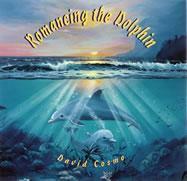 Romancing the Dolphin is an example of flowing Classical and Jazz styles. Dolphins breathe Prana (vital essence of life) from the top of their heads, and use a full spectrum of their brain capacity all the time. One may learn to activate a greater capacity of the brain through experiencing these Dolphin voices with the music. Dolphins have touched humans in multi-dimensional ways and offer a potential of immense joy. David Cosmo built an electric powered kaleidoscope viewing device to film these flowing forms that are filled with spirit and life, almost as if looking at creation where all things come from. The soundtrack for "Kaleidology" is also on the CD "In Here-Out There". David is fascinated with Sacred Geometry and how it reveals the cosmic order of the universes, and how it is applied in Quantum Physics, Cosmology and Biology. David's father is a retired Dr. of Biology who penned the name Kaleidology after experiencing this video. The Greek words: kalos (beautiful) eidos (form) ology (the Science of) create the title, Kaleidology (The Science of Beautiful Form). These ever-changing forms with East Indian and Tibetan transcendental meditation music create a transformational experience.